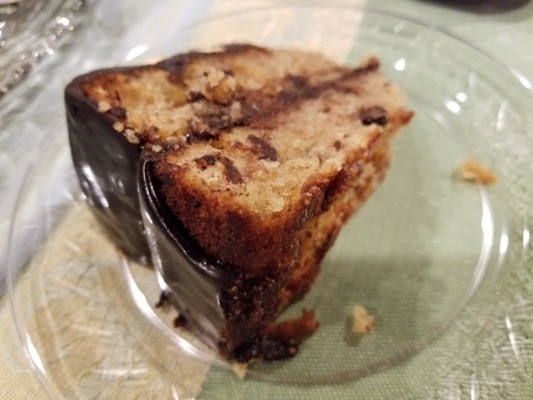 This year 2018, a couple of weeks before Passover I had quite a few over ripe bananas..Once Purim passes It is time to plan for Pesach in my mind so I thought to alter my recipe and make a banana cake for Passover. 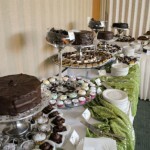 As you have guessed by now it was a big hit…and disappeared quickly off the Seder dessert buffet. 1. Grease 2 nine inch layer pans and set aside. Use kosher for Passover non stick spray. Pre heat oven to 350° F and place a rack in the middle section. 4. Separate 4 extra large eggs. Add yolks to banana batter. Add 2 teaspoon of Passover Vanilla as well. Set egg whites aside for a moment. 5. Measure out 3 cups of blanched almond flour and 1 cup matzo cake flour, combine and add to the banana batter. 6. Add zest of one large orange and 2 tablespoons of orange juice. Add 1 cup of chopped bittersweet chocolate 55%, like chocolate chip size. 7. In a mixing bowl beat egg whites with a pinch of salt until getting stiff and then add 2 tablespoons of sugar gradually in a steady stream with the mixer running and beat until stiff. 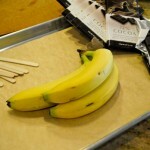 Fold egg whites into banana batter carefully as to not deflate. 8. Divide batter equally among the greased pans. Place pans in the hot oven. 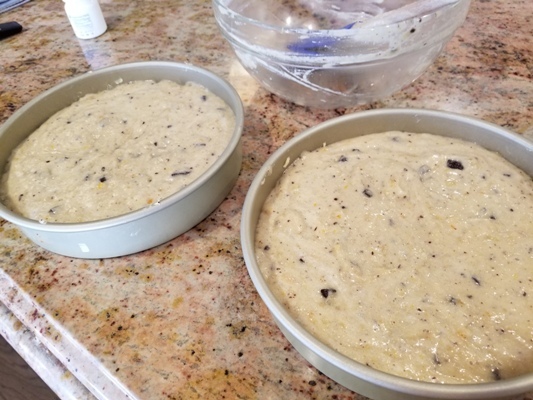 Bake about 30 minutes and then reduce heat to 325° F and continue baking another 15 to 20 minutes, or until a tester comes out clean. About 45 to 50 minutes total. 9. 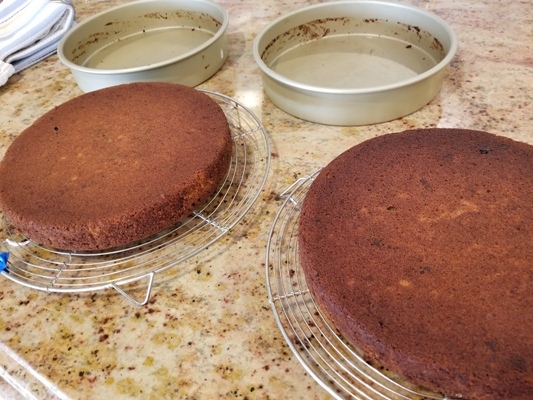 Remove pans from oven and cool on racks for about 10 minutes, run a knife around the edge and invert to remove cake. 10. 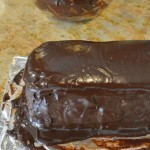 Cake can be wrapped and frozen at this point or continue to assemble. 1. 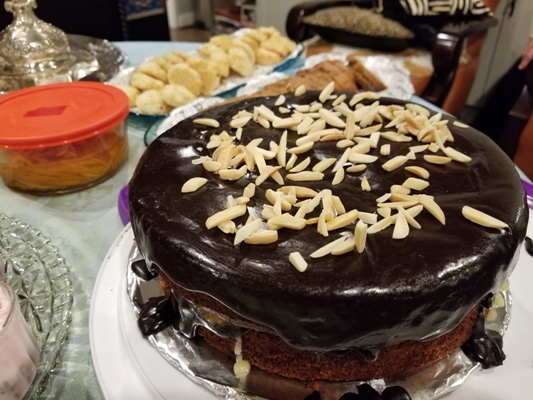 In a medium bowl over a pan of simmering water ( a double boiler) melt 3 ounces semisweet chocolate, from bars kosher for Passover ( I use Schmerlings 72%) with 1/2 cup water, 3/ 4 cup margarine (must be kosher for Passover) or butter, and 3 tablespoons Safflower oil, kosher for Passover. 2. Combine 3/4 cup cocoa powder, unsweetened, 1/2 cup plus 2 tablespoons sugar in a small bowl . 3. Stir all ingredients in double boiler bowl until melted together. It will not look smooth or shiny. Remove the bowl and set on a dish towel on the counter. 4. 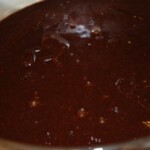 Pour cocoa sugar mix into bowl of melted chocolate. Stir until sugar dissolves and glaze is smooth and shiny. 4. 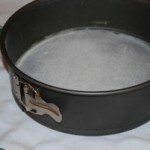 Let glaze cool until thickened slightly. When glaze reaches a thick consistency use a spatula to top one layer and spread glaze to edges. Top this with the cooled caramelized bananas. Next place the second layer of cake on top and frost the whole cake with the remaining chocolate glaze. Sprinkle with some roasted almond slivers if you like . Keep refrigerated. 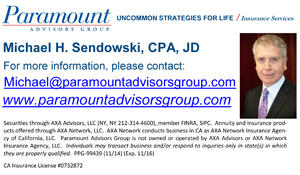 This is great for Pesach and it is easily done pareve. Happy and Healthy Passover to you and your family!! This looks like an amazing dessert for Passover. I wanted to let you know that I made the Passover Bastilla recipe and froze it in the springform pan . It came out delicious and was enjoyed by all. I’ve missed your blog–it was always a great source of recipes. 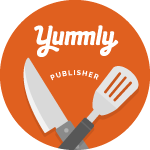 Are you going to publish another cookbook soon?